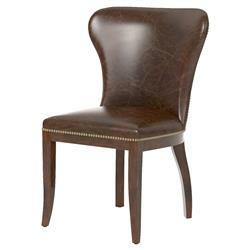 Irresistible top grain cigar leather covers this classically handsome accent chair. Whether grouped around a dining table or standing solo in a corner, this is the best seat in the house. The eight-stage hand aging process creates a beautiful, full-bodied brown upholstery that's both beautiful and masculine at the same time.